The first server that the small to medium sized business (SMB) purchases is often one that allows for file sharing and collaboration called network attached storage (NAS). As the business grows and becomes a small to medium sized enterprise (SME) the first point of storage trouble is often that standalone NAS. It runs out of capacity, it can't provide enough performance or both. As a result the SME is forced to add standalone NAS after NAS to keep up with these demands which leads to storage sprawl. Storage sprawl places pressure on every aspect of the SME as the storage line item becomes a larger and larger part of the storage budget, while the ability to provide 24/7 uptime decreases. 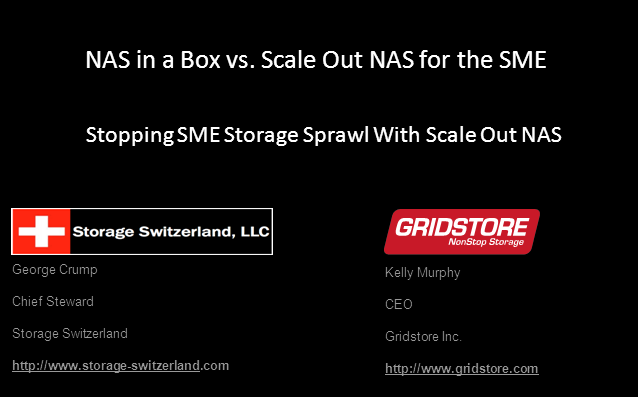 Join Storage Switzerland's Lead Analyst, George Crump and Kelly Murphy CEO of Gridstore for a discussion of the issues with Storage Sprawl and how you can stop it by taking a technology created for the large enterprise, Scale Out NAS, and applying it to the mid-sized market.